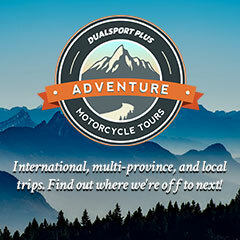 Mention American-made motorcycles to most bikers and they almost automatically begin thinking about large displacement V-Twins. 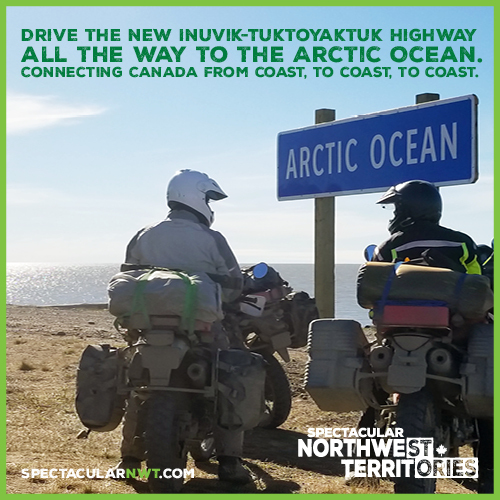 That’s because for the past sixty years or so most American-made motorcycles, be they Harleys, Indians, Victories or whatever, were almost always big bore V-Twins. 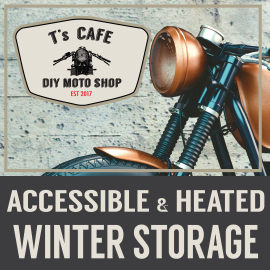 It therefore comes as a surprise to many to hear that during the opening four decades of the American motorcycle industry, half a dozen American manufacturers, including Indian, built a variety of bikes powered by air-cooled in-line 4-cylinder 4-stroke engines. In the early 1900’s it is estimated that as many as 300 American companies began building motorcycles of one design or another. During these early years, many machines consisted of little more than strengthened bicycle frames into which one or another off-the-shelf motors were bolted. This early period of builder proliferation, however, was fairly short-lived. Several factors accounted for the rapid reduction in the number of bike builders. One was the pace of design innovation and technological progress introduced by the more serious and capable builders. Most of the smaller builders couldn’t afford to compete, even if they were technically capable. A second factor was a general economic slowdown, combined with rising production costs and difficulties securing materials and components, all attributable in part to the onset of WWI. Still another factor was the growing competition posed by the fledgling auto industry. American car builders made rapid advances in the quality of their products, embraced large volume production methods, and as a result were increasingly able to offer family transport at ever lower prices, sometimes even lower than motorcycle prices. 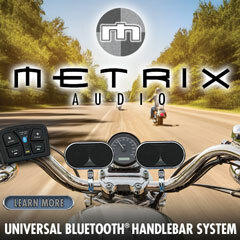 but rather with a lifestyle focus emphasizing performance, excitement and the adventures of motorcycling. 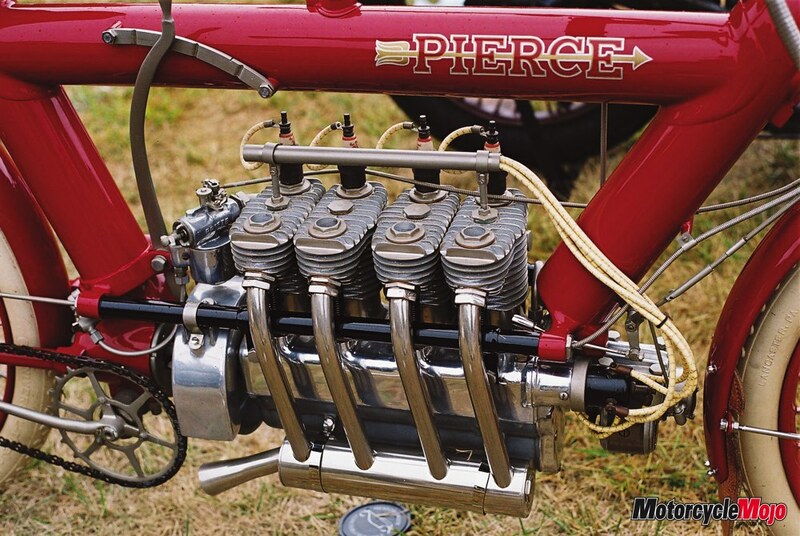 The first American bike builder to offer a four-cylinder motorcycle was the Pierce Motorcycle Company founded in 1909 by Percy Pierce. Percy was the son of George Pierce, whose car company built the famous Pierce Arrow. Young Percy had been impressed by the Belgian-built FN in-line four and brought one back from Europe to serve as the inspiration for his improved American four. The first Pierce Fours displaced 700cc and had direct drive via shaft to the rear wheel, also an American first. 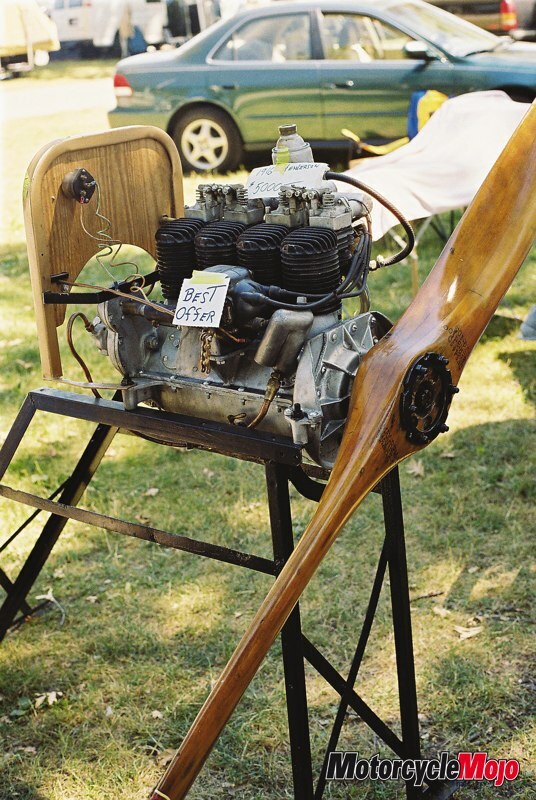 The T-head engine employed a side-valve intake and exhaust system, with a valve on each side of the cylinders, and with fuel supplied by a single carburetor. Pierce’s machine was considerably more modern looking than the FN, and included numerous design innovations. One of these was a heavy-duty frame that doubled both as a fuel tank and an oil tank. The fuel was carried in the top cross and rear down tubes, while the oil was carried in the front down tube. The engine was employed as a stressed component of the frame. The bike’s running gear and leading-link front suspension were minimal, with a sprung saddle serving as rear suspension. The bike also lacked brakes. In 1910, Pierce upgraded the four with the introduction of a two-speed transmission and clutch. The Pierce Four was a quality product for its day and fairly pricey, despite being rumoured to be selling at a price that was less than its cost of production. Fewer than 500 of the Pierce Fours were built before the company discontinued bike production in 1913.
and Tom Henderson founded Henderson in 1911. William was the engineer and the brains behind the design of the Henderson Four, which he continued to refine with A, B, C… models. Refinements of their early four included a manual clutch and 2-speed gearbox (1914 C Model), the introduction of a mechanical oiler driven by the cam gears and a kick-starter (1916 F Model), and then the use of an oil reserve in the crankcase and a 3-speed gearbox (1917 G Model). Early Henderson models displaced 1068cc (65ci), but later versions were enlarged to 1301cc (79ci). The Henderson Fours developed a reputation for being tremendously smooth and for being very powerful, winning numerous endurance competition awards. The 4-cylinder Hendersons were also well-finished and very good looking machines. Not surprisingly, they sold well. However, despite their product quality and sales success, Henderson struggled to stay financially solvent. The end result was that in November 1917, the brothers sold their company to Ignatz Schwinn, who relocated the motorcycle production operation to his hometown of Chicago. Schwinn was a bicycle manu-facturer who had entered the motorcycle field in 1911 with an initial intent to design and build his own machines. As it turned out, he opted to purchase an existing company, the Excelsior Motorcycle Company, in 1912. 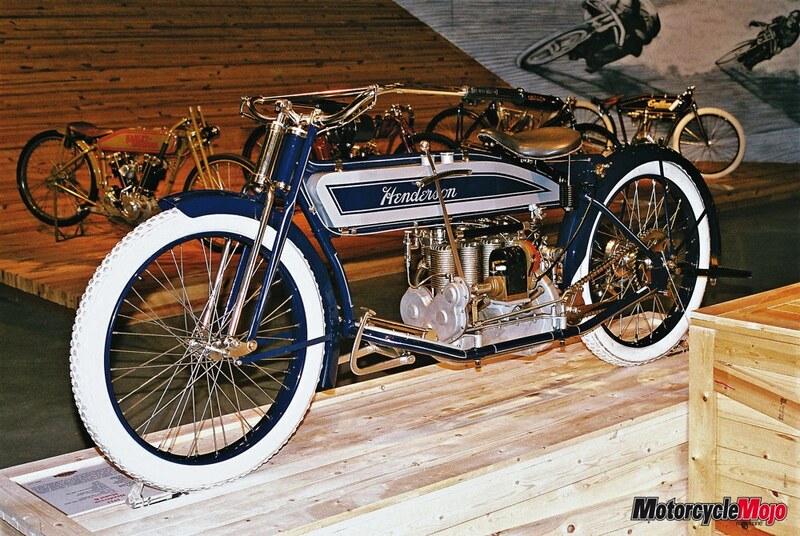 Excelsior built singles and a fast 1000cc (61ci), V-Twin that in December of 1912 became the first motorcycle to be officially timed at 100 mph. The purchase of Henderson in 1917 enabled Schwinn to expand his motorcycle product range. Schwinn supported continued development of the Henderson Four, which from 1919 onward appeared with a revised tank logo and was now known as the Excelsior-Henderson. Initially, both Henderson brothers stayed with the company and made the move to Chicago, but not for long. Tom Henderson left both the company and the motorcycle industry in December of 1918, and brother William resigned the following year to form a new motorcycle company, ACE. Arthur Lemon took over design responsibilities for the continued development of the Henderson fours. The 1919 Excelsior-Henderson Four came equipped with a GE generator, while the 1920 Model K was the first motorcycle to use full pressure lubrication. The Model K had redesigned cylinders with side-valve intake and exhaust. By now the Henderson Four was developing 18 horsepower. In 1922, Lemon introduced the 28 hp De Luxe version. This bike proved to be capable of a top speed of 98-100 mph as confirmed in police department tests. 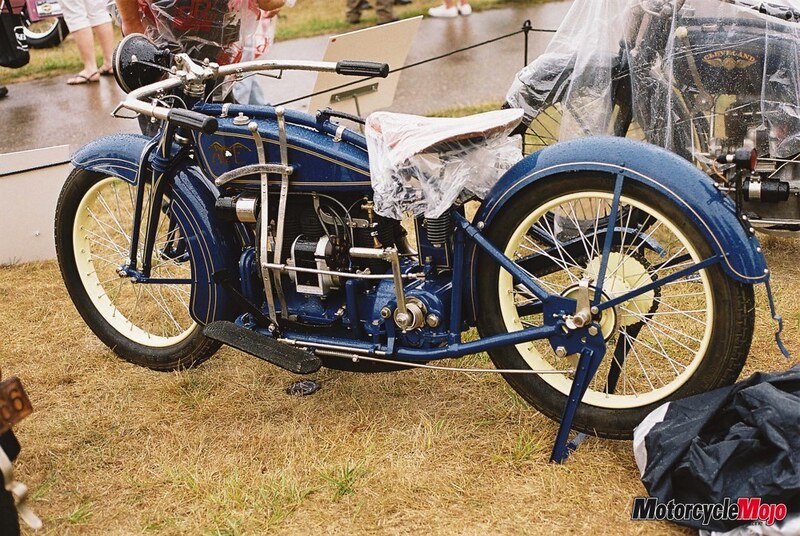 The 1925 version of the De Luxe came with a new frame, a lower centre of gravity and a 4-gallon gas tank. Two years later the De Luxe was fitted with ‘Ricardo’ type cylinder heads as standard. In the summer of 1928, Schwinn succeeded in luring away Arthur Constantine from Harley-Davidson, and appointed him Chief Engineer. Constantine undertook a complete makeover of the De Luxe. The model that emerged the following year was the famous ‘Streamline’ Henderson KJ, a 1301cc (79ci), bike that in-corporated over 50 new design features and produced no less than 40 hp at 4,000 rpm. After leaving Excelsior-Henderson in 1919, William Henderson re-located to Philadelphia and quickly got to work on the design of a new in-line four, similar in basic layout to the earlier engine, but with no interchangeable parts. Introduced in 1920, the ACE four was a quality product. The new bike’s engine was equipped with F-heads, overhead intake valve and side-valve exhaust, and displaced 1229cc (75ci). A single carburetor located at the rear of the cylinder head provided fuel to the cylinders. The new ACE motor proved to be both powerful and durable. It employed a 3-speed transmission with an automotive-type foot clutch and a manual stick shift on the left side of the gas tank. As with earlier Henderson models, the ACE frame layout had the fuel tank placed below the upper frame tube. The new ACE was ruggedly built and weighed a hefty 390+ pounds. The bike’s front suspension employed a leading link front fork with a hidden compression spring, while the back end was rigid with a sprung saddle. The front of the bike was very tidy and contributed to the overall good lines of the bike. Stopping power was provided by an external-contracting rear brake that was by now an industry standard item. As with other American bikes of the day, there was still no front brake. 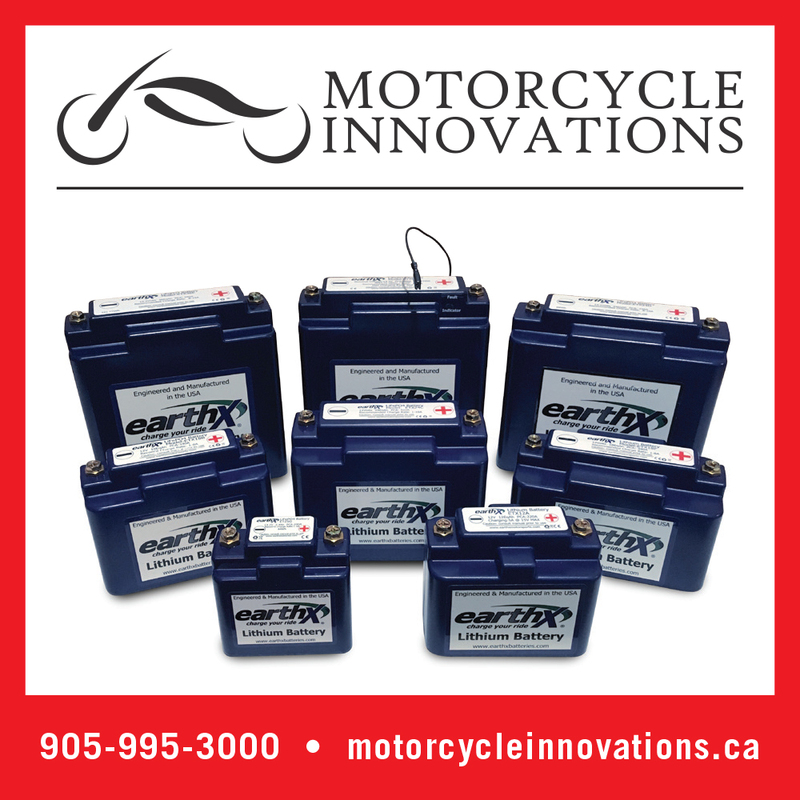 Since modern type motorcycle cables had not yet been invented, all rider controls employed complex shaft and joint linkage systems. Like the earlier Hendersons, the ACE proved a competent performer in racing and endurance competition, and set a transcontinental (New York to LA) speed record in 1922. So successful was the new ACE Four that demand for the model outstripped the company’s financial abilities to meet the demand. As with the earlier company, ACE struggled to generate the cash flow needed to stay afloat. 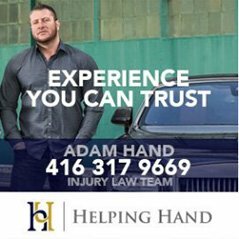 These difficulties were compounded when William Henderson was killed in a road accident while testing a bike. In 1923, a special high performance version of the ACE Four called the XP4 set a new speed record of 129 mph. Despite this achievement and other successes in various forms of motorcycle competition, ACE closed its doors the following year. 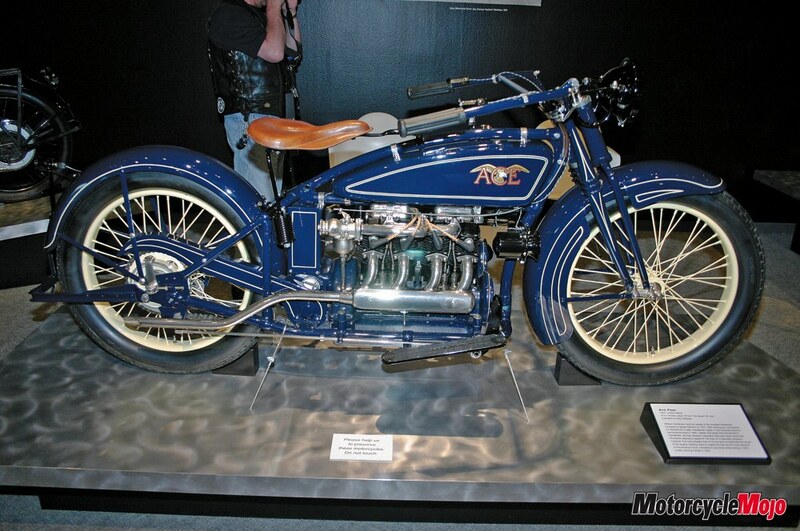 In 1927 the American motorcycling public was surprised to discover that the Indian Motorcycle Company had purchased the rights to ACE and had resumed production of their impressive four. The reintroduced fours were now badged as Indians, and came exclusively in the traditional bright red colour scheme of the new owners. 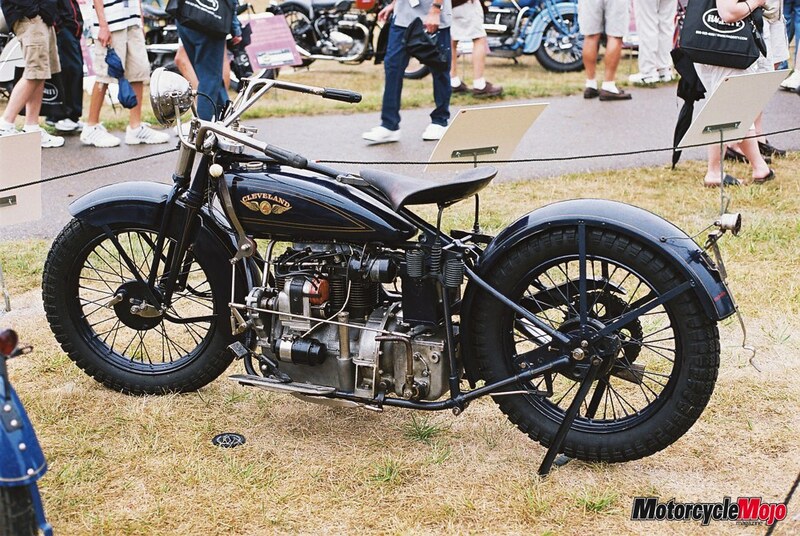 By this time, another American motorcycle manufacturer had begun building in-line fours. Established in 1915, the Cleveland Motorcycle Company had initially produced 269cc 2-stroke singles, and later an F-head four-stroke single. The first Cleveland Four was designed by F.E. Fowler and built in 1925. The ‘Fowler Four’ drew on some of the design features of the now-defunct Pierce Four and displaced 598cc (36ci), small by comparison with other competing fours and V-Twins of the day. A larger displacement 737cc (45ci) version was released the following year and was much better received. 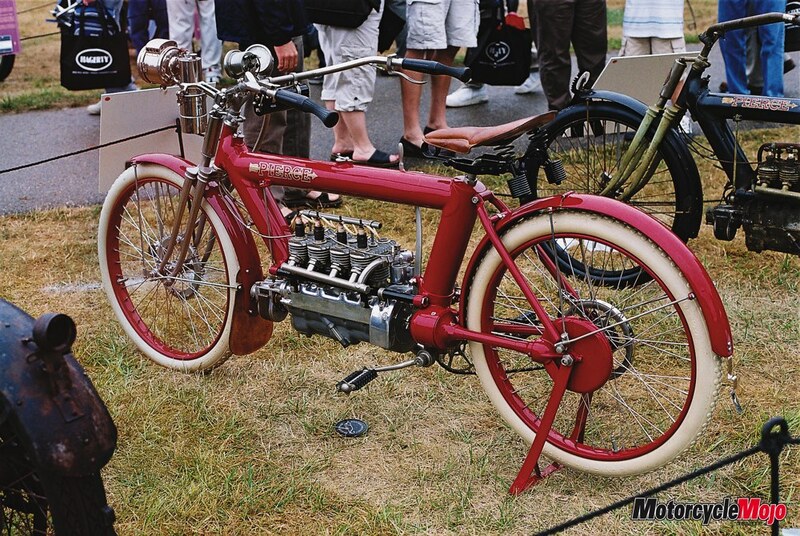 The Cleveland Four had T-heads (flathead with side-valve intake and exhaust), a 3-speed gear-box with a clutch pedal, a hand-operated gearshift and chain final drive. The front suspension was a leading link fork with compression spring while the rear was solid with a sprung saddle. Like the ACE Four, the Cleveland fuel tank was positioned below the upper frame tube. Small oil-pressure and ammeter gauges were provided, but no speedometer. 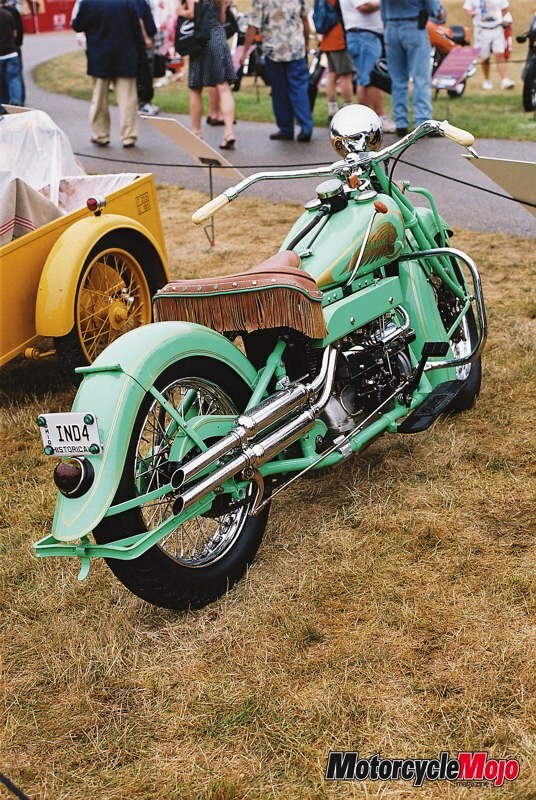 The ‘Fowler Four,’ like the green version pictured on page 36, was reportedly actor Steve McQueen’s favourite bike from a pure, ‘eye candy’ perspective. He loved to just sit and look at it. He bequeathed it to his long-time motor-cycling friend Bud Ekins on his death. Only about 100 were ever built. 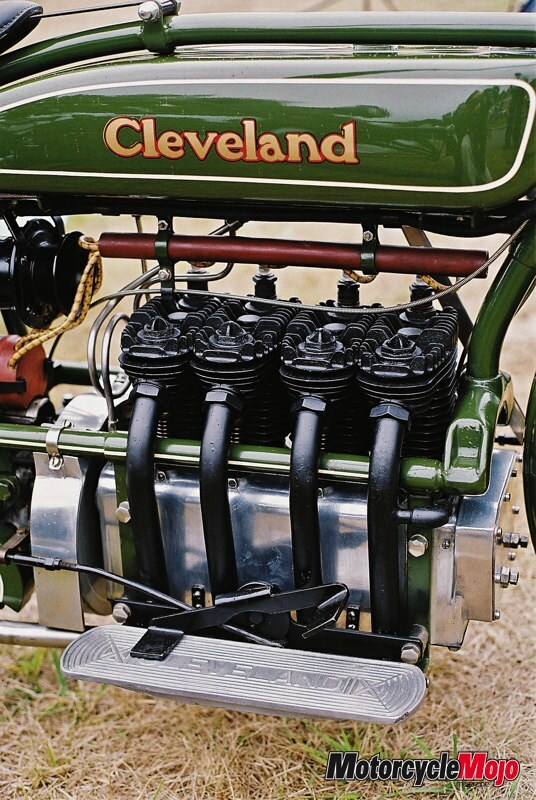 In 1927, the 996cc Cleveland Four appeared, the company’s most powerful engine to date. That 61 cubic inch in-line four was the first American motorcycle to come equipped with a front brake. With a top speed of 90 mph, it definitely needed one. The stock market failure of October 1929, and the ensuing Great Depression spelled the end for many American motorcycle companies. Cleveland went out of business in 1929, and Excelsior-Henderson ceased production in 1931. Of these two company closures, the latter was by far the most unexpected. Henderson sales had remained very strong in spite of the general economic slowdown. 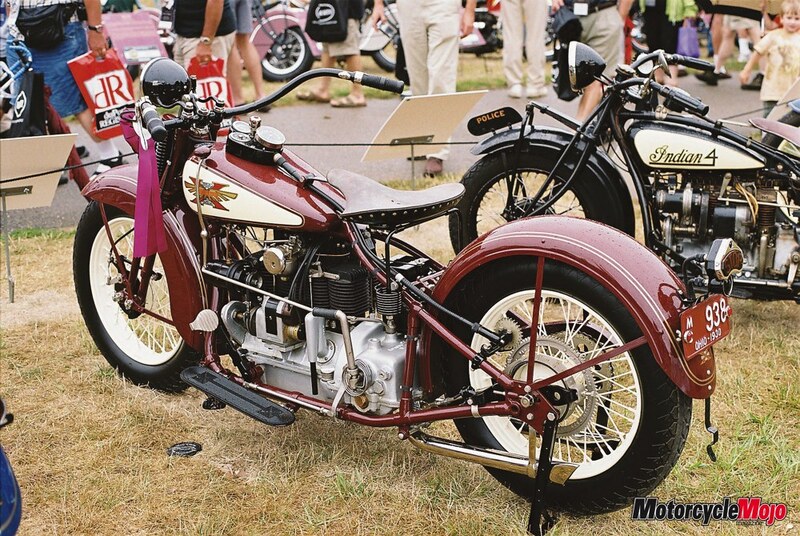 In the spring of 1930 the company introduced the Excelsior-Henderson ‘Special’ KL. Legendary rider Joe Petrali did two high speed runs on a new KL on a newly constructed smooth concrete road in Illinois recording a two-way average speed of 112.61 mph. His highest recorded one-way speed was 116.12 mph. The KL proved to be so tractable that it could be run without difficulty in top gear at speeds ranging from as low as 8 mph to as much as 110. This model was rapidly adopted as the standard police motorcycle by police departments from coast to coast. In 1931 Ignatz Schwinn made a trip to Washington during which he was convinced that the recession was going to get worse and continue for some time to come. Schwinn resolved to protect his investments, minimize his risks and focus on his base business, the manufacture of bicycles. He returned to Chicago, assembled his senior managers and announced “Gentlemen, today we stop.” Thus it was that with its sales order book virtually filled for the year, Excelsior-Henderson was out of business. The Excelsior-Henderson dealers were stunned, but that was it, finito. 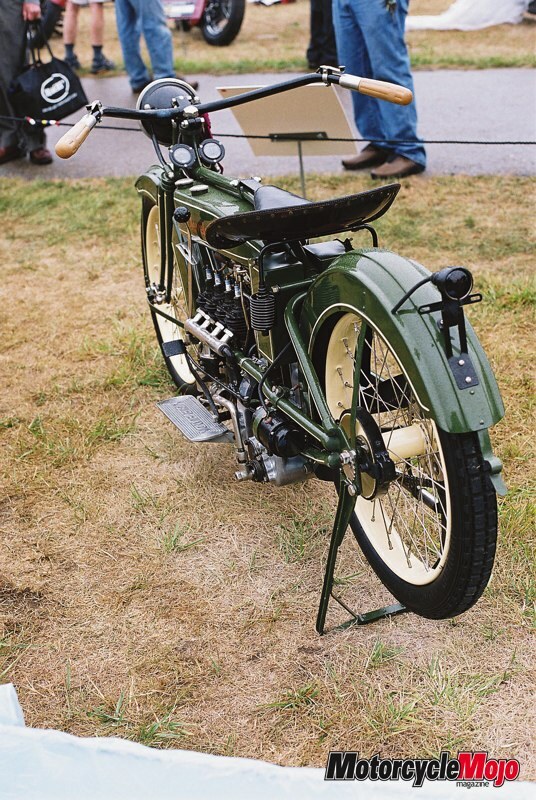 This left only Indian building four cylinder motorcycles in the United States, the rebadged ACE Four which went virtually unchanged until 1936 save for changes in suspension, brakes and cosmetics. In the year following the Wall Street crash, Indian underwent several changes of ownership. The company tried all kinds of product diversification schemes to stay afloat, none of which worked, but through it all one investor stayed the course. That investor was industrialist E. Paul DuPont who became the company’s majority shareholder. In their worst depression year, 1933, the company produced fewer than 2,000 bikes in total. The company tried all kinds of things to reduce production costs, including adopting a standard frame for use by all of its large displacement models. At the same time, thanks to the influence of DuPont, Indian abandoned the red-only colour scheme. Eventually the company offered no fewer than 24 colour options for its new bikes, with a quality of paint finish that was second to none. By 1936 the US economy was starting to recover. 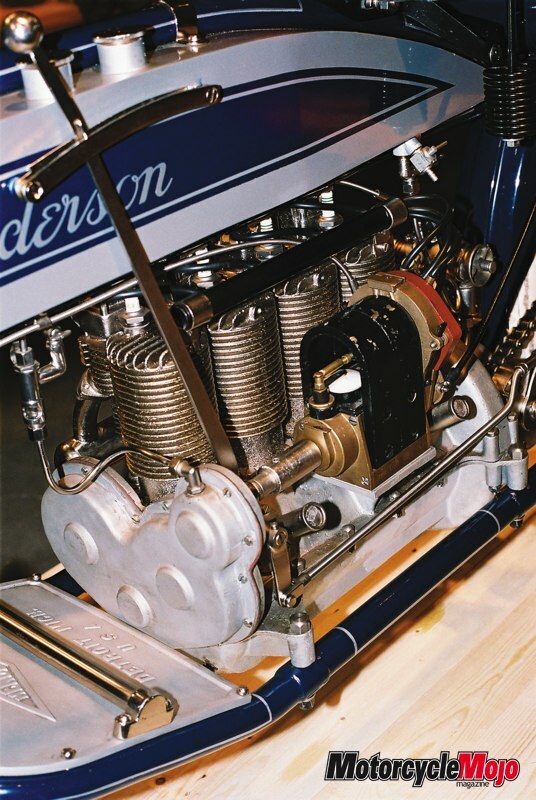 That year Indian introduced what became known as the ‘upside-down Indian.’ It reversed the original overhead intake valve and side-valve exhaust layout in an effort to gain added performance from the 1265cc (77ci), four. The new motor not only developed reliability and overheating problems, but it was also widely regarded as being a considerably less attractive looking motor. 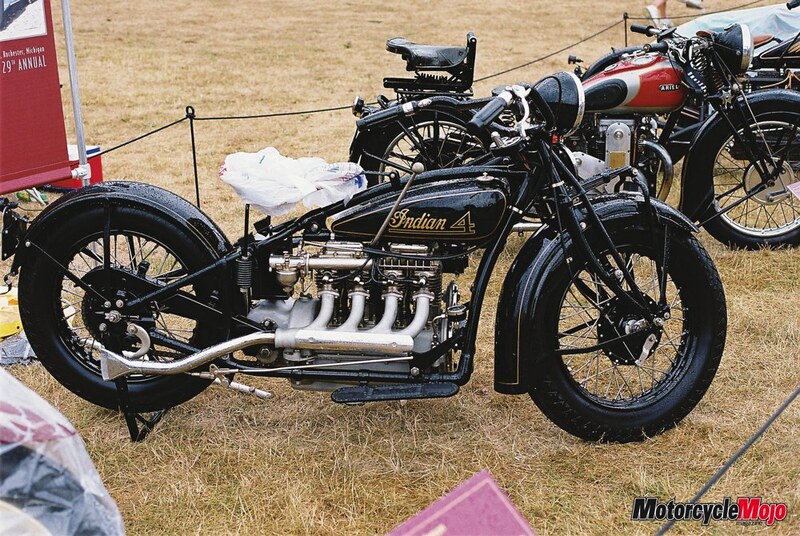 Indian reverted back to the F-head layout two years later and thereafter largely restricted themselves to making cosmetic and detail changes to the fours aimed at making the bikes more visually appealing. 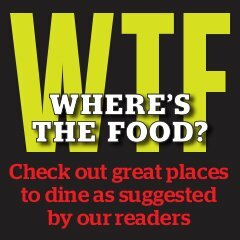 Indian finally quit building their in-line fours in 1942. By then the U.S. had been plunged into the Second World War and bike sales were slumping. The American market also seemed to have settled on the V-Twin as their preferred engine configuration. If Indian was to continue to compete with Harley-Davidson as the second U.S. bike builder, it would have to compete across a narrower product line and twins were seen as the way to go. Thus came an end to America’s 33-year history of in-line 4-cylinder motorcycle production.